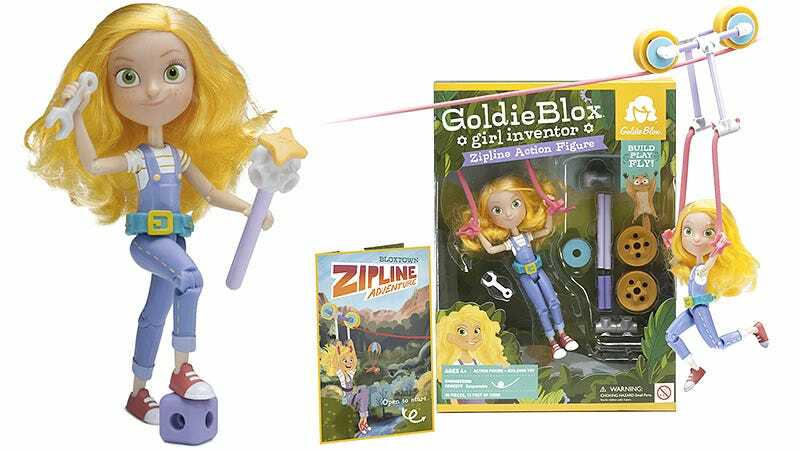 Because very few girls actually grow up to be princesses, fashionistas, or fairy tale characters, the folks behind the GoldieBlox building toys decided to create an action figure for girls that promoted brains over beauty. So this holiday season Barbie will be in competition with Goldie: a pint-sized inventor wearing a toolbelt and brandishing a wrench. To help encourage girls to seek their full potential and realize they can grow up to be anything they set their minds to, the $25 figure includes a kit for building a functional zip line. It allows Goldie the inventor to swoop in for emergency repairs, but also helps teach kids basic engineering principles and problem solving.